Public events were held in the largest cities in Australia – Brisbane, Sydney, Melbourne and Perth. The talks were well attended, not only by members and supporters of the ASF, but by a variety of other libertarian people. Workshops and discussions also took place. 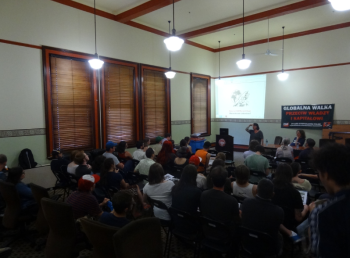 An event was hosted by Jura Books and discussions took place in the Melbourne Anarchist Club. Members of the ASF and the Secretariat also visited the last living veteran of the Spanish Revolution in exile and another long time activist of the CNT exile, born in exile. On behalf of the lnternational Workers Association, we wished them much health and happiness and thanked them for their work in bringing the ideas of anarchosyndicalism and the lWA to Australia. Since November 13, France has been in a „state of emergency”, during which protest has been criminalized and many have been arrested and subject to house arrest. One of them is our comrade Ali from the CNT-AlT, who was put under house arrest at 3:30 AM on November 28. From the lWA, we roundly denounce the actions of the state. We remind that it is different states and religious zealots who are battling against each other to gain control over people and divide them. All of us are potential victims. We must unite and bring down the tyrants – all those existing and all those who wish to be. Down with the state of emergency and long live international insurgency! OZ Dive maky is an NGO in Bratislava. Priama akcia is taking action to protest wage theft in the organization. Michal worked in the NGO for almost a year and a half, on a fake self-employment contract, because the NGO did not want to make health and social security contrabutions. A few months ago, M. decided to leave and they signed an agreement terminating their "cooperation". The NGO recognized that it should pay him 950 euros, but haven't paid it yet. M. tried many times to get his money. Finally, Priama akcia visited the NGO, demanding payment. lnstead of paying what was owed, the NGO's lawyer threatened them. Priama akcia is calling on individuals and organizations to support the efforts to get M.'s long overdue pay. There is an e-mail form on their webpage, which you can use to send a protest. In the last weeks, some texts were published by unions in Spain concerning the Libertarian Federation of Mexico, their claims of being supported the „the CNT, the IWA, the FAI and IFA” and their denounciations of the Anarchist Federation of Mexico. The IWA has never been in contact with the Libertarian Federation of Mexico. Perhaps a source of confusion could have been the unauthorized publication of a letter of support from the so-called CNT Catalunya. This „CNT-Catalunya” uses the initials „CNT-AIT” on its letterhead and stamp, but is not a part of the IWA since it is not part of its member section. The CNT-Catalunya later clarified that this publication was not official. At the same time, it is worth pointing out that the organization in question has not formed part of the CNT-AIT for 20 years, since 1995. Therefore its use of the initials AIT on its letterhead and stamp is misleading. We ask this organization to stop its incorrect use of the initials of our federation. A comrade from the CNTE who worked as a psychologist with drug dependant persons at CIBE/ Red Cross Alicante was unfairly dismissed, without good reason or proper process from her job of 8 years. The comrades in Spain are demanding her reinstatement plus the dismissal of the coordinator of CIBE who is responsible for this situation. The IWA supports these demands and will join in actions against Red Cross internationally. No to unfair dismissals and unaccountable bosses!